In my previous post, I put together my build of the Raspberry Pi Laptop, but was unhappy with the fact that my circuit board would be exposed, and there would be loose wires (mainly the USB cable) just freely arched over the Pi. 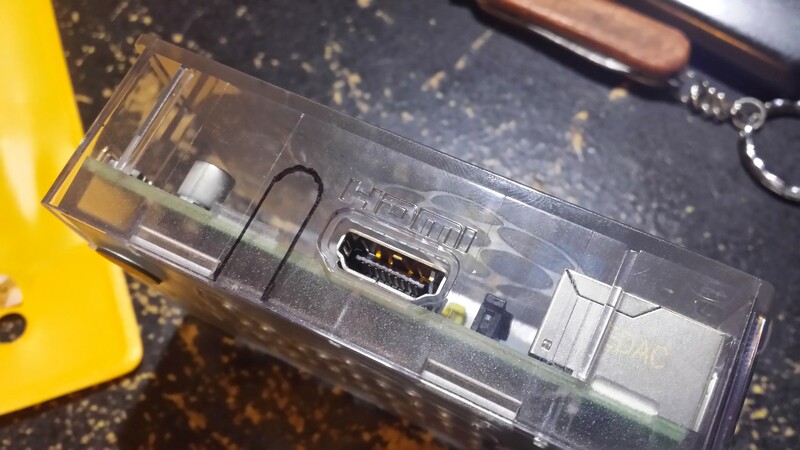 I decided I should cut a USB pass-through slot in the cover of my Raspberry Pi case, since the USB draped over the circuit board in a simple arc, and laid down very nicely by the HDMI port and USB ports. The plan is to cut an arched slot to the left of the HDMI port (since that’s how the Atrix Laptop Dock is configured) for the cable’s entrance, and another arched slot to the right of the USB ports for the cable to exit the case and loop back on itself to plug into the adjacent USB ports. Be willing and able to modify your Raspberry Pi case in a permanent way (for good or bad, as your skills allow)… I can’t be held responsible for any personal mistakes you might make. First things first! Read this whole section before doing any actual measurements. You will need to get an understanding of what we’re trying to do with the case before you go marking it up needlessly. Then come back and follow the instructions to do the actual measurements. Unfortunately I don’t have pictures for this (sorry v_v) since I eyeballed it, and wasn’t sure if it would work. So I’ll try to describe it as best I can. What you’ll need is your Pi plugged into the Laptop Dock as an initial frame of reference, like below. 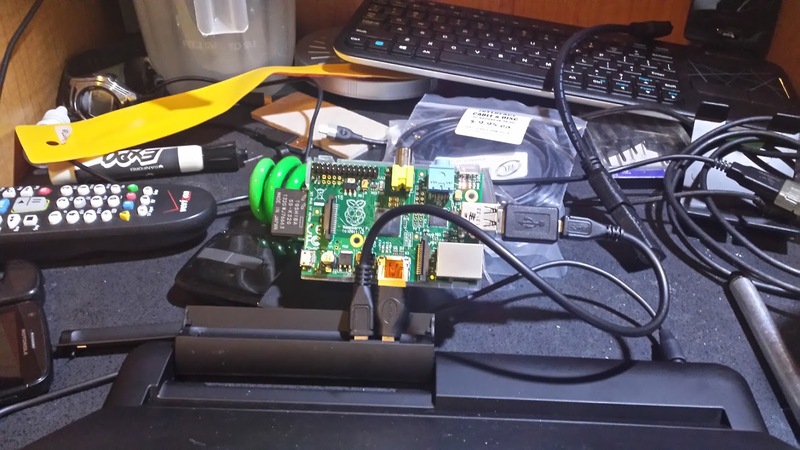 An example of the Raspberry Pi connected to the laptop dock, without the case cover on. Note the HDMI adapter and the USB extension cable next to it. That USB extension cable’s support (where it’s slotted to prevent excessive bending at the joint) is the focus of your measurements. 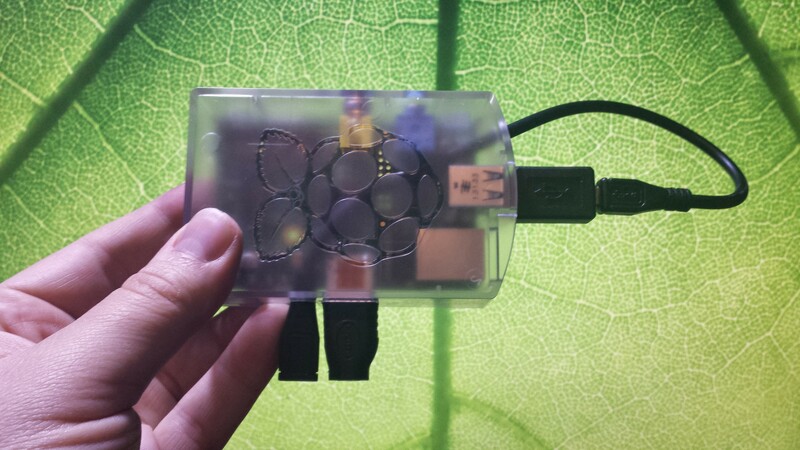 To start, you’re going to need a piece of paper/ruler, and your case (with the cover removed from the Pi initially). First we need to measure from the right edge of the Ethernet Jack’s housing (large silver cube on the bottom right of the board above) on the Pi to where the USB extension cable’s overlap begins (just to the left of the HDMI port on the Pi). You’ll take note/make marks where the right edge of the Ethernet housing is, and both sides of the cable’s circuit-board overlap are. and one mark further away to the right (the rightmost edge of the Ethernet Jack housing). Now, remove the Pi from the laptop dock and put the case cover put back on the Pi. Remember this process I’m about to describe – you’re going to need it for the USB-side slot later. Place your measurement paper over HDMI-port side of the case cover and line up the mark for the Ethernet housing with the right-side of the Ethernet housing. 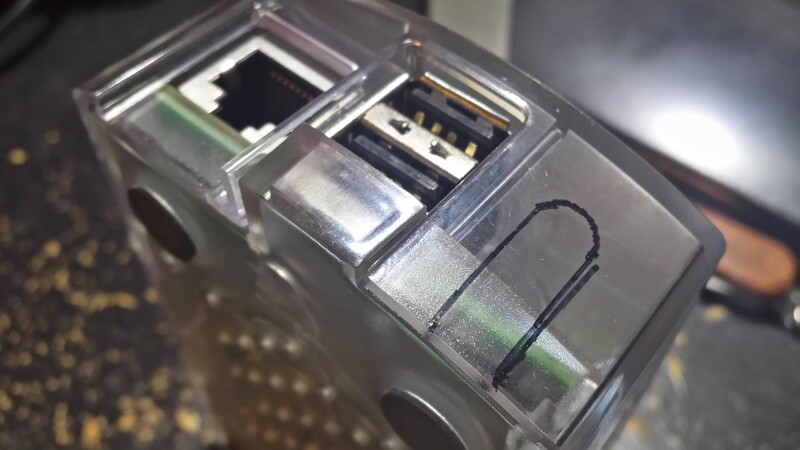 Once you have that lined up, at the other end of your paper, lightly mark the bottom edge of the case to match the marks for your USB extension cable. This is going to be the starting point for the slot cut. Your Case Cover should have only 2 marks: one for each side of the slot you’re going to cut. Using a straight-edge, go up from each of those case-edge marks, and trace a line to be perpendicular with the visible circuit board inside the case, and stop at the circuit board. Using the same measurement paper, place it along that perpendicular line, so that one USB slot mark is at the end of the line, and the other continues up past the circuit board. Mark the case at the location of the top-most USB slot mark, and extend your perpendicular line to that mark. This will provide enough room for the cable’s diameter to sit comfortably on the circuit board. Do the same for the other marked side of the slot. You should now have two roughly equal parallel lines that your USB extension cable’s wire should fit nicely between. Then, using a punched hole in a notebook paper, your imagination, or some other similarly sized arc too, connect the two lines with a nice arch. You should now have 2 lines drawn on your case: one for each side of the slot that will be cut next to the HDMI port. They should be connected with an arch. What you should end up with is something like the image below. In my build, I only estimated the height, I didn’t measure it, so it extends up a little bit more than necessary. For this side you’ll need that same measurement paper, but we’re going to use it differently. Since the need for a Starting/Ending point is less important here, all we really need is the width of the USB cable. If you wanted, you could take new measurements of the width of the actual cable itself (not it’s joint support), but that’s really going to limit the USB cables you can use in the future if you have to replace it. Take a look at the case cover’s USB port slot for the stacked USB ports. Just to the right of it (above the board’s LED area) there is a “support beam” of sorts. You don’t want to cut into that: it’s extra plastic to have to melt away, and it’s probably there for a reason. Move to the right of the “support beam” about 2-3mm and place your measurement paper’s marks for the USB extension cable slot width. Align the measurement paper with the bottom edge of the case, and make marks for the slot’s initial cuts. You should have your HDMI-side slot marked, and now the two starting points for your USB-side marks on the edge of your case. Now, using the same technique you used for the HDMI-side slot, draw your perpendicular lines up from both marks, up to the circuit board. Place one of your measurement paper’s USB extension cable mark at the end of those lines, and continue the lines up to the second USB extension cable mark. Then arc the lines the same way you did before. Again, I estimated my lines, and hand-drew my arcs in the image below, but yours should look similar (aside from the mistake line that got away from me). First things first! Read this section through before doing any actual cutting. You will need to get an understanding of what we’re trying to do with the case before you go cutting it up needlessly. Then come back and follow the instructions to do the actual cuts. Now for the fun part – the Dremel. For this project, I used two pieces: a circular pad and a conic metal bit. The circular bit is for cutting the straight edges of your slots. The conic bit is for melting away the plastic in the arch as well as smoothing the interior/exterior edges of the slots. There will be melted plastic on the inside wall of the case cover at the edges of your slots. However, the plastic cools after a few seconds and can easily be chipped away manually using the conic bit in your hand. Warning: Always use Eye Protection. You’ll notice in my photos the blinds were open – and every light was turned on; I was wearing Google Glass with the sunglasses attached to get the videos and images. Helpful Tip: As with any power puncture tool, make sure you put your bits on straight and tight. Before you put it to the plastic, give the bit a spin in the air and make sure it’s not wobbly or off center. If it is, you run a pretty good risk of your circular bit shattering, or your case getting all scratched up. Start with the circular pad, on a low speed and approach the bottom edge, between your marks, on your side of choice to get a feel for what it’s going to take to cut through this plastic. Once you are comfortable with the speed of the drill and understand how the plastic will react, turn up the speed a click, and move to the edges and make your straight cuts. Cut along the lines up to the bottom of the arc. The straight edges cut for each slot. In the images above, I started out on the HDMI side, since it was broader, and gave me a better feel for cutting for the first time. While making the cuts, melted plastic would seep around the edge of the slot to the interior of the case cover, so I used my conic bit in my hand to carefully scrape it off the corners of the cut. Finer smoothing comes after the arch is cut. Before you put it to the plastic, test the Conic Bit when placed in the drill to make sure the tip doesn’t wobble. If your conic bit is like mine pictured above, it is machined and rough, for smoothing. The goal here is to get rid of the plastic in the slot. I used my finger to press down on the plastic protrusion I had made with my circular bit until it started to turn white at the base of the arc where it was still connected to the case. Eventually it snapped right off and left only the plastic in the arch. Then I turned my conic bit on and bumped up the speed one click and set it against that plastic to try and melt it out of the arch, being careful not to get too close to the actual line I drew until I was ready to smooth out the arch. Once the majority of the plastic is removed from the archway, you should start smoothing down the excess plastic to make the arch cleaner and more defined, eventually melting through your drawn line. During this process, run the conic bit down the straight edges of the slot to remove any stray/excess roughness, and ease the side of the slot into the arch smoothly. After you’re done with smoothing the edges, brush the plastic dust off with your hand and run some water over the case cover to get rid of the hard to reach dust. Be sure you dry off the case cover thoroughly before placing back on your Raspberry Pi. The finished Case Mod, put together. I haven’t done any case modding in at least 7 years, and this is the first time I’ve used my Dremel since I bought it in as many years ago. So if you have any tips, or thoughts for how this process can be improved, leave them in a comment below. If you have questions about something I didn’t cover here, let me know, and I’ll do my best to answer them.